The Council has finally begun to appreciate the value of the Belmont Nature Trail in the form of a notice issued under the Environmental Protection Act 1990 – Section 23, against adjoining owners for the removal of waste materials tipped onto the site. I note the author is described as a, ‘Local Area Champion’! The same officer arranged for the launch of, ‘Community Payback in Harrow’ in Belmont on 22 February. This is designed to promote the employment of youth offenders in community service on worthwhile projects. 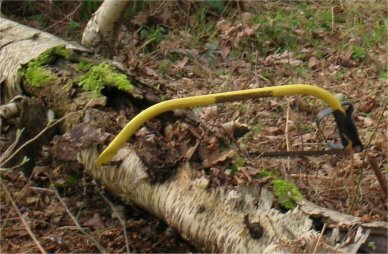 We have done this before at Stanmore Country Park, where it was found to require fairly close technical supervision to avoid damage. Work on the five major reserves continues apace, thanks to the wardens concerned. There is an ongoing programme of dates published with our Newsletter. Work has begun on the design of a web-site for the Forum, thanks to Stephen Bolsover. In due course we can publish the address. Carole Lis and Simon Braidman have continued their invaluable work to counter the effects of inconsiderate planning decisions in the Green Belt. There is no consistency between the declared policy and the recent decisions, and the implication of a hidden agenda conflicting with the policy cannot be ruled out. Furthermore the Council’s unwillingness, or inability, to take notice of a petition of 8000 signatures presented by our Chairman at a recent Planning Committee, requires an explanation. I now invite Martin Verden to put this question formally to the Council. It is now common knowledge that I shall hand over the chair of the Forum this year. I have, for some time, felt that it needed a new lease of life and a younger man. I now believe that one has been found. Professor Stephen Bolsover is a modest man and has been constant over the years a Warden of Bentley Old Vicarage Nature Reserve. Against the undertaking by John Hollingdale to look after the secretarial work, I am increasingly confident that Stephen will take over formally at our next meeting in May, and that under his leadership the work of the Forum will, not only continue, but increase in magnitude and importance. Fred Freeman writes: We have received grants of £24500 from ‘Living Space’ (a department of the office of the Deputy Prime Minister) £6000 from Harrow Council and £500 donated by the Friends of Bentley Priory. This money has been used to upgrade both the Deer and Weald paths, create a bat cave and the removal of unwanted vegetation. Bentley Priory has been sold and we await the plans that the new owners have for this important site. Peter Peretti reports that on one occasion three Buzzards were seen soaring above Old Lodge Meadow and he also saw a male Ring Ouzel last year. In 2005 the cattle started their grazing on May 20th but didn’t cope with the vigorous bramble regrowth. It is hoped that the grazing will commence earlier in 2006 to solve this problem. The working party at Stanmore Common on the 11th February was a real highlight. I cannot thank enough the other wardens who acted as supervisors and the council who took part and the other volunteers. A lot of good work was done on and everyone enjoyed it. More work has been carried out since and there are now 2 new paths with dryer and better public access. All the reserves need volunteers and if anyone has a few hours to spare the wardens would be very grateful. Its enjoyable work in the open, you come back feeling great and mentally refreshed. We have not had much work to do during the spring, simply the standard low level litter clearance and tidying. We have therefore had plenty of time to admire the spring arrivals. First, in early February, came the flowers of winter heliotrope, a non-native relative of butterbur, which flourishes under the trees in the wood. On the 5th of March a glossy, bright Red Admiral butterfly flew along the woodland edge, presumably having just emerged from a winter hiding place. Then, in early April, came the traditional masses of daffodils and primroses in the wildflower meadow and the first lesser celandines in the wood. One White Willow has been removed from the boundary with the church so we have planted a few twigs from it by the stream in the new bog area. Hopefully they will like this environment. Our annual Open Day is on Sunday 16th July, beginning at 11am. All are welcome. Dave reports that the pond filled-up in February but by mid-March was drying out again. Frog spawn appeared later on. The last four months we have been doing general clearing and cutting down a fallen willow. We have been extending the open area in John Hall’s field (Compartment 4) with a lot of assistance from the BTCV. I have also removed the bramble that smothered the stile into this compartment and next winter will attempt to reinstate the connecting footpath. Following a chat with one of the Park’s regulars I removed six dustbin bags full of old discarded beer cans and bottles from one drinking spot. With the warm weather in early April four species of hibernating butterflies were again on the wing. Summer’s coming?